This is delicious. Fennel is the secret that makes it so nice. I do hope you give it a try, it was really a hit this evening. While the pasta is cooking, roast the pumpkin seeds in a dry pan until the begin to pop…it will only be a minute or two so watch them, otherwise they will quickly brown and burn. 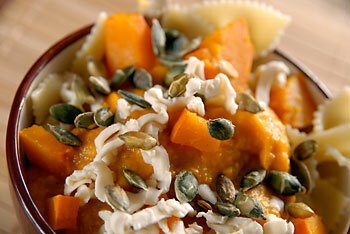 Sprinkle some of the soy cheese on top and then a few roasted pumpkin seeds. 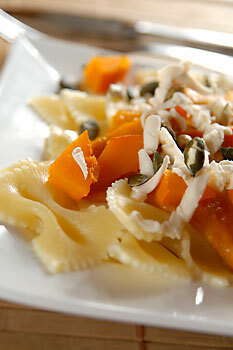 Posted by Chris Walker on December 12, 2007 in Main Dishes, Pasta, Pumpkin, Soy cheese.